Paper size: 17.2 x 22.6 cm. 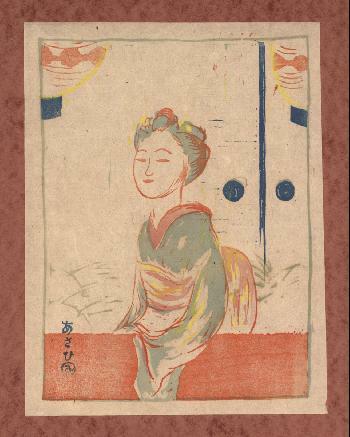 Published in 1925 as part of a portfolio of 10 prints by the most important artists of the day (Onchi Kôshirô and Hiratsuka Un'ichi among them); still attached to the original brown portfolio sheet (29 x 38 cm). Fine impression, colours and condition, printed with colours only. For 6 other images from this series and the title page see: The Warmth of Woodblock Prints, pp 28-29; also see: Nihon no hanga, Vol. III, Chiba City Art Museum 1999-2004, p. 51, and at various other places.